Written for department chairs and deans, this well-researched resource offers a practical reference for how to create and sustain a more civil and harmonious departmental culture. Filled with useful information, including relevant case law, the book gives readers what they need to know to enhance the climate, culture, and collegiality in an academic department, as well as the university. Robert E. Cipriano is professor emeritus and former chair of the Department of Recreation and Leisure Studies at Southern Connecticut State University and is a recognized expert on collegiality, conflict management, and communication in higher education. He has conducted research on the topic of collegiality and conflict management and writes, presents, and consults frequently with a variety of institutions. 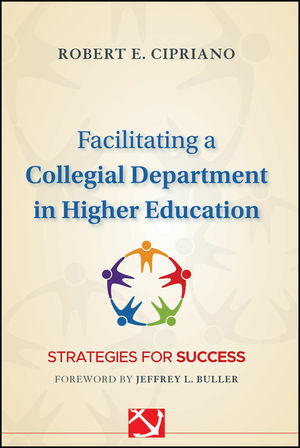 Chapter 1 Collegiality and Civility in Higher Education. Chapter 2 Respectful Codes and Hiring for Collegiality. Chapter 3 Strategies for Promoting Collegiality. Chapter 4 Managing Conflict Within the Department. Chapter 5 University-Wide Responsibilities in Promoting a Collegial Campus. Chapter 6 Structural Realignment, Budgetary Support, and Cyberbullying (Ellen R. Beatty). Chapter 7 Case Law Regarding Collegiality in Higher Education. Appendix: A Four-Year Study of Department Chairs.